Get your free instant life insurance quote today! Get your free life insurance quote today with no obligation to buy. Thanks for stopping by NextGen Life Insurance, we are excited to have you here! Let’s face it, shopping for life insurance, regardless if it’s term or whole life insurance, can be confusing. With so many different types, it can be downright overwhelming for me sometimes as well. If you don’t know what you’re doing or if someone isn’t looking out for your best interests, it could become a real burden on your family, along with your checkbook. Thus the reason I wanted to create NextGen Life Insurance. After countless questions over the years and seeing people get sold a policy that wasn’t in their best interest, I wanted to create a site that was completely honest, unbiased and fully transparent in all things life insurance. So, that’s exactly what we’ve done with NextGen Life Insurance. As you’ll see once you begin to dig in, we provide you with not only access to free term life insurance quotes from a number of carriers but also tons of articles that should address many of the questions on your mind. And, if we haven’t, then be sure to contact us and let us know how we can help or if their’s a particular blog post we can write. So, How Much Life Insurance Do You Need? When starting out, it’s tough to know how much life insurance you need or even where to start. It’s understandable, really. And you’re not alone. I’ve spoken with hundreds of clients in the past few years and a lot of them had little to zero idea when it came to choosing the best life insurance for them as well as how much they needed. 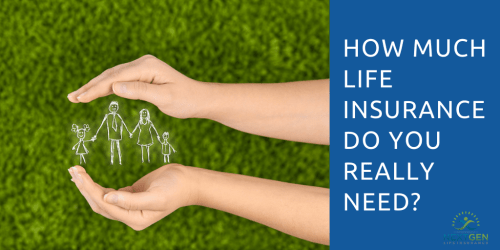 We’ll take a look at some of the most common life insurance questions and beliefs that people have about life insurance. More importantly, I’ll share some of the most popular ways on how you can determine how much life insurance you really need. Also, be sure to make sure you check out our Life Insurance Guide as well. Life Insurance: Is it an Investment? Depends on how you define “investment”. If we’ll be technical about it, you’re not really investing your money into the market (unless you have a cash value policy which we’ll talk about later) when you buy life insurance. If your beneficiaries never have to use it, you’ve essentially received a negative return from a pure investment standpoint. But hey, that’s a good thing—you’re still alive after all. When you buy life insurance, what you’re buying is peace of mind. You’ll be paying a certain amount of money that gives your beneficiaries a guaranteed payout should the unfortunate event happen. In that sense, it is an “investment”. Say we have a 30-year-old healthy guy. He gets a term policy that costs him $500 per year for coverage of $1 million. Let’s say it’s a 20 years term policy. At year 15 of the policy, he dies. By that time, he paid a total of $7,500 in premiums which in return allowed him to leave his beneficiaries with $1 million. A big upside for a relatively small premium in this case. While the benefits of getting a life insurance policy are clear, a lot of people still don’t do it. Why? Let’s take a look at the most popular myths about life insurance. My employer already provides life insurance, I don’t need anymore. I work from home, I don’t need it. I’m already old, I can’t have one. It’s better to put my money in savings instead of life insurance. I’m single, I don’t need it. I have health problems which prevent me from getting one. I’m perfectly healthy, I don’t need it yet. I have no idea which life insurance is best for me. I’m not the breadwinner in the family so I don’t need one. Cost – A study conducted by LIMRA and LifeHappens showed that 44% of millennials overestimated the cost of life insurance by as much as 5 times. Also, 61% of participants said that they’re skipping on life insurance because of other financial priorities. Not knowing how much life insurance you need – A lot of people have no idea how much life insurance they really need so they just give up before even getting started. Pre-existing condition – While it does affect the type of policy you can get, there are a lot of insurance companies whose offerings cover a wide range of health conditions. These, however, tend to be naturally more expensive. Obesity – Being extremely overweight negatively will definitely affect how much you pay for life insurance. Did you know that insurance companies have a “build chart”? It lists measurements for height along with the corresponding max weight allowed for each class. A 5-9 male weighing 206 lbs will score cheaper insurance versus someone of the same height but weighs 10 lbs more. Lack of understanding – All the jargon that surrounds financial topics usually intimidates a lot of people. So instead of trying to learn more about it, they tend to just walk away. Since you’re reading this, however, you’re off to a good start. Here’s the thing: Some people might not need life insurance at all. Every person’s current living condition is unique. However, for most people—life insurance is simply a must. Especially if you’re the head of the family or the lead income generator. Having life insurance is your way of protecting your family against financial hardship should the unfortunate event happen. Term Insurance – Life insurance that provides coverage for a set amount of years. If the policyholder dies within the specified “term”, the beneficiaries can claim a death benefit. Permanent Life Insurance – Life insurance that provides coverage for the entire lifetime of the policyholder. Permanent life typically includes a savings benefit (referred to as cash value) on top of the death benefit. The following are some of the most common pieces of advice you’ll hear when determining how much life insurance you need. One of the most popular estimates is to simply multiply your salary by 10 (or another multiplier) to know how much life insurance you’ll need. From a practical standpoint, it makes sense—simply because it’s based on a realistic baseline. However, this method does not take into consideration the key aspects of your financial situation. What about your savings? Or what if you’re a stay-at-home parent? To answer the second question, the value provided by a non-working parent should be considered if they die. Most likely, the surviving parent will need to pay someone (e.g child care) to provide services that are currently being done by the now deceased parent. The 10x rule does not take this into consideration and may cause budgeting problems. Similar to the 10x method but it may have even a higher chance of being off-mark depending on when you started the insurance. The same issue of not taking important financial factors into consideration are still here. Some may argue that it’s better to just get more insurance, but in reality, accuracy in determining what you’re beneficiaries will need in the future trumps a “just get more life insurance” approach almost all the time. “DIME” in this case stands for Debt, Income, Mortgage, and Education. Compared to the other formulas on this list, it presents a more realistic (and accurate) approach to determining how much life insurance you’ll need. Debt – List down all of your debt and add it up. Include mortgage and final expenses (funeral) as well. Income – Determine how long your family will need the support after you’re gone. Once known, multiply this by your annual income. The length ideally should include the number of years until the youngest child finishes high school. Make sure to talk to your spouse to get an honest overview of what needs to be prepared for financially. Mortgage – Determine the total amount you’ll need to pay off your mortgage in full. Education – Determine the scope and cost of the education of all your children. Will college be covered or only through high school? This is an important step, so make sure you’ll be setting realistic estimates. While it does take a little more time, I believe DIME is the best method for determining how much life insurance you need. To help guide you on how much life insurance you need, here are some of the best questions to ask yourself. What is your monthly budget? – Figure out how much you can realistically and comfortably set aside for life insurance. What type of life insurance is best for me? – Decide if you want term or whole life insurance. Make sure it fits your needs. How much debt do you currently have? It’s important to take this into consideration as it will affect your capacity to pay for premiums (and adjust the coverage). How much can you save each month? – Knowing the actual monthly savings figure will allow you to determine how much premium you can pay. What are your long-term savings goals? – Similar to the above, figuring out your target savings goal has an impact on the type and cost of life insurance you need. How much do you need for retirement? This accomplishes two things: Gives you a number to base how much premium you can pay (since you’ll put aside money for retirement regularly) and it helps determine how much cash value you want to have in the future (should you choose a permanent policy with a savings feature). How much income will your family need? – This is crucial. This greatly affects your decision with how much your policy should be. How long should your term be? As mentioned in the “Education” portion of the DIME method, another critical factor to consider is the length of coverage. While a longer coverage is ideal, it also means you’ll pay for higher premiums. As much as possible, be as accurate and realistic with your capacity and goals to get maximum potential value from your life insurance. Include life insurance in the big (financial) picture. Often, people don’t see insurance as a primary need. They prepare for almost everything: educational expenses for their kids, mortgage payments, other debts, future expenses, and more—save for life insurance. And this shouldn’t be the case because it’s as important as the others mentioned. Buying multiple, smaller, life insurance policies is also an option. For example, you can get a policy with your wife as the beneficiary for 30 years and then and get a separate one for the kids for 20 years until they finish college. If you can, get the best coverage for your current needs. Don’t cut back on the coverage now simply because you think it will save you a bit. In the long run, the extra cushion will help your beneficiaries. Discuss your options with your spouse. Ask each other your opinions on the actual amount of the policy that the family will need. Will it need to replace your full income? Or just a part of it? It may be ideal to get longer policies if your children are still young. In doing so, you’ll feel more secure due to the longer coverage and it gives you enough time to increase your income and asset accumulation. Determine the income shortfall for beneficiaries and how long they will need it – You can make some rough estimates by using some of the methods we’ve covered above. Truth be told though, it’s never easy since a lot of factors come into play when determining how much life insurance you need. Do your due diligence should you wish to do it the DIY route. After all, we’re talking about a considerable portion of your income here. Use online calculators – A quick Google online search for “how much insurance do I need calculator” will yield pages of results showing online calculators. It works by asking you to input some estimates on your current financial status, such as mortgage balance, annual salary, personal loans, student loans, car loans, and others. Popular ones include calculators from Bankrate, LifeHappens, and CalcXML. The goal is to give you an easier time coming up with an estimated life insurance amount. But while helpful, ultimately it only gives you a sample computation. When you do want to begin setting up your life insurance, you’ll have to do your own research and complete the necessary tasks and requirements by yourself. Talk with an Insurance Agent or Financial Advisor – When handling personal finances (especially something as important as insurance), it pays to work with a professional. Ask yourself this: If you have no idea how to fix a plumbing problem in your house, will you still try to do it yourself? Would you ask your neighbor for help? Google it and then try to figure it out yourself? If you’re like me and most people, the answer is: No. The risks outweigh the benefits. What if you make the problem worse? After spending significant hours, energy, and money on trying to fix it yourself, you realize later that it wasn’t the best idea. Not only did you make it harder for yourself, you ended up spending more. In this situation, most of us would have found better returns on our resources (time, energy, money) if we just simply hired a professional plumber from the start. It makes absolute sense. A professional is always a good start for calculating how much life insurance you need. A true professional handles the job in the most efficient and cost-effective way possible. So, there you have it. Now you should have a much better idea of how much life insurance you need. Check out the NextGen Life Insurance Blog for lots of other articles that should help answer plenty of your questions. Don’t forget to check out our comprehensive Life Insurance Guide too! Bear in mind that some of the links in this post are affiliate links and if you go through them to make a purchase I will earn a commission. Keep in mind that I link these companies and their products because of their quality and not because of the commission I receive from your purchases. The decision is yours, and whether or not you decide to buy something is completely up to you. Save up to 58% on your life insurance policy today!